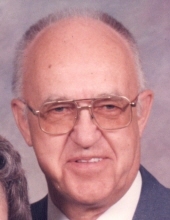 Don Gordon Strole age 93 of Olney formerly of Jasper County, Illinois passed away Tuesday, February 19, 2019 at Aperion Care, Olney, Illinois. Funeral services for Don will be held at 2:00 p.m., Sunday, February 24, 2019 at the Crain Funeral Home, Newton, Illinois with Pastor April M. Dailey officiating. Visitation will be from 12 noon until time of service Sunday in the funeral home. Burial will be in the Shiloh Cemetery, Willow Hill with military rites by Jasper Post No. 20 of the American Legion. Memorial gifts for Don may be made to either the Trinity Lutheran Church, American Diabetes Association, American Heart Association, or the Leukemia Foundation. To plant a tree in memory of Don Gordon Strole, please visit our Tribute Store. "Email Address" would like to share the life celebration of Don Gordon Strole. Click on the "link" to go to share a favorite memory or leave a condolence message for the family.